Yesterday was a pretty momentous day for Warsaw, Polish and world football. Legia Warsaw became Polish champions for a tenth time after Lech Poznań lost 2-0 at home to relegation favourites Podbeskidzkie Bielsko-Biała and three Poles started for Borussia Dortmund in their narrow loss to Bayern Munich in the Champions’ League final at Wembley. My footballing path was rather more modest but still holding considerable interest for those excited by the ins and outs of Warsaw lower league football. 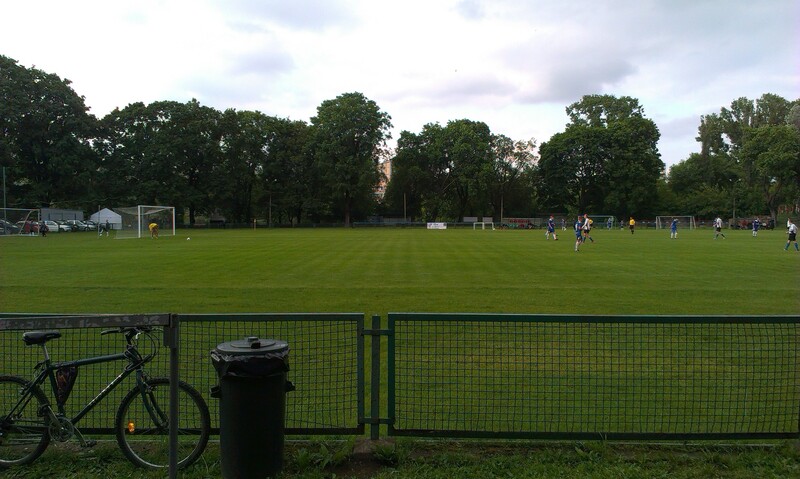 I once more set out to watch my local team Drukarz Warszawa. This season the top of the Warsaw Liga Okręgowa group one has seen a fierce battle for supremacy between Drukarz and a side from South-East Warsaw, PKS Radość. Both clubs have scored on average over three goals per game and have +40 goal differences. Until very recently PKS had the upper hand but a brutal run of fixtures due to the late spring has seen their form plummet. Indeed PKS have lost their last three games, whilst Drukarz have continued to win. All this meant a victory yesterday would take Drukarz six points above PKS and pretty much assure promotion to the IV liga (5th tier). Recently Warsaw has been visited by some rather strange weather. A week ago summer seemed to be here, with blue skies and scorching temperatures, but storms, rain and an unseasonably autumn chill have moved in over the last couple of days. Undeterred by this I took the short tram to Park Skaryszewski for Drukarz’s early evening match with Dolcan Ząbki’s reserves. Until a short while ago Dolcan’s second team had also been competing for promotion but they have since fallen away, in midweek they even lost 5-1 in Ząbki to mid-table Olimpia Warszawa. After getting to the ground I took my seat in the stand which lines one side of the pitch. A relatively decent crowd of people had turned up for the match; including approximately 30 or so young Drukarz fans who sang pretty much throughout the game and several polite Dolcan supporters. As for the match itself, Dolcan started out on top with some slick passing moves but very quickly Drukarz made their physical presence felt. Drukarz soon showed that they quite simply wanted to win much more then the team from Ząbki. By half-time Drukarz had punished some sloppy Dolcan defending to go into the break with a 3-1 lead. Apart from Drukarz’s dominance the first half was marked by news filtering through that Lech Poznań had lost, confirming Legia as Polish champions. 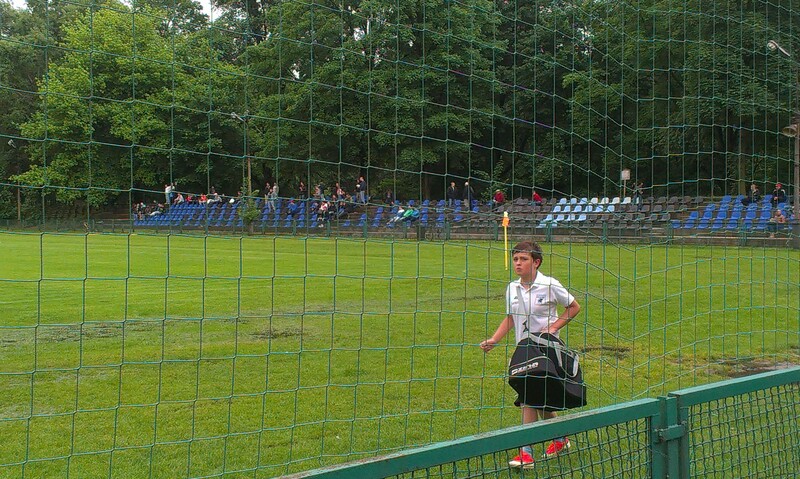 One Drukarz fan exclaimed loudly ‘In four years Drukarz will win the league.’ I have to say I admire his positivity! The second-half saw more of the same from Drukarz, a decent cross from the left was headed in to make it 4-1. Drukarz kept attacking and soon they had stretched into an unassailable 7-1 lead. Dolcan were able to notch a consolation goal from a penalty bringing it back to 7-2 but Drukarz went down the other end and quickly scored another. 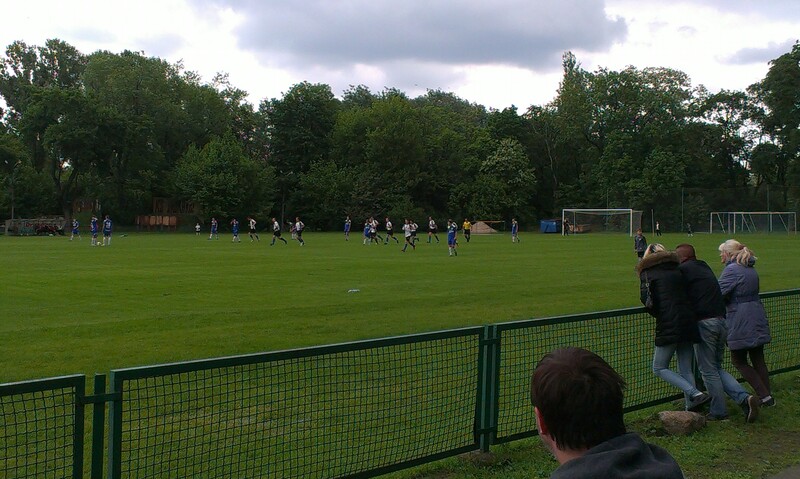 The final score ended up 8-2 to the home side to the general joy of the 80 or so onlookers. Drukarz thus stretched their lead over PKS Radość to six points and look likely to make the IV liga next season. As for PKS, they have two crucial games to see whether they can finish second and take part in an end of season promotion play-off. Next Saturday they take on third placed Wicher Kobyłka in Radość, a team who lie only one point behind PKS and then on June 5th they play at Drukarz. With five games still to play it’s definitely going to be an exciting end of the season. As for me I headed off into the night to watch the BVB-Bayern game. That may have been a cracker but one thing’s for sure, it didn’t have ten goals. This is rightbankwarsaw signing off. This entry was posted in Uncategorized and tagged Dolcan Ząbki, Druka, Groundhopping, Liga okręgowa, Park Skaryszewski, PKS Radość, Polish football, Warsaw, Wicher Kobyłka. Bookmark the permalink.